this might be the funniest office clip EVER. i had actually kind of forgot about it until the marathon tonight and i just thought i'd put it on my blog so whenever i am having a bad day i can look at it and laugh...and those of you who also think car crashes and vomit are funny...enjoy! happy only one more week until the new office where Jim Halpert gets it! Tonight we tried carrots - oh the humanity! Now miss Scarlett, you come on and eat juss a little honey! This morning, before I barely even touched her mouth with the spoon, her little nose wrinkled up, the hands flew up in protest and she actually started this little gagging sound as if she was choking even though absolutely nothing had gone in her mouth yet....of course, this was enough to make me double check since any remote little gag or cough strikes fear in me like nothing else can. After confirming there wasn't so much as a drop of milk left for her to choke on, I decide I'm sure she is doing this on purpose, that she somehow knows this fake choking will make me stop trying to feed her. 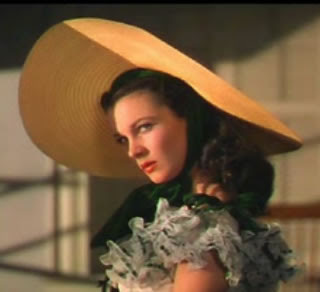 Refusing to be mentally defeated by a 7 month old, I go back to trying again and immediately her little hands start rubbing her fists across her eyes and forehead with a type of despair equal only to Scarlett O'Hara's dramatic reaction as Rhett Butler is leaving her to go off to war..
"How could you do this to me? The pain, the anguish, the betrayal..."
After this, she sits in her little chair for a good 15 seconds in what I can only describe as shocked stillness until finally erupting with volcano-like projectile spitting that goes all over me, the chair her clothes and even Brogan, a perfectly innocent bystander. Has anyone ever watched Friday Night Lights? We've watched it since the pilot right after babygirl was born. I think she was home for a week and we saw the first show and since then each show I like more than the last. In the beginning it took me a while to get into actually understanding and appreciating the story line, but now I am hooked. It's not just about football and teenagers, it has more depth than that but still gives you the good teenage angst stuff once in a while that I love. And given that the beautiful guy from my all-time favorite (though short lived show) Homefront is in this gives me all the more reason to love it. At the moment, Bridget is trying to prevent me from watching this by fighting her very predictable and reliable bed time. The past week or so she has been very particular about going to sleep often fighting naps and now even bed time. The screaming is as loud and awful as anything I've ever heard, but I have a feeling she would rather just be up playing and hanging out with us rather than getting the sleep she so desperately needs. So, were letting her go for a while. We have a routine that we've always used practically since she started having a regular bedtime, so I know she's okay, but it's sooooo not fun to listen to. I know the Muldrow's can appreciate this as I went back and looked at Aimee's posts about Matthew's sleep problems and imagine my (not) surprise when I realized Matthew's issues took place when he was almost exactly the same age as Bridget is now. There must just be a light bulb that goes on in their little brains that says, "hey, sleeping is not as much fun as my elephant book or big bird bouncy, so i think i'll just scream at the top of my lungs 'til i get to do that stuff again..." I'm certainly not glad they had to go through this with Matthew, but it does help me realize that this is just a phase and I won't have to rock her until she is in college! Here's a little video to celebrate his 60th and kick off where he'll be spending his next 60...it is in a home...a lake home that is! Chris and Kristi welcomed Cole Daniel into the world yesterday evening at 5:40pm. After waiting months to find out whether we had a he or a she and what the name would be we are all so excited to finally have Cole here! "The beautiful red-headed baby weighed in at 7lbs 6oz and is 19 and a half inches long. Although born by Caesarean, mother, father and baby are doing beautifully. Thank you God for this new and wonderful miracle." Congratulations guys - Bridget can't wait to meet her new cousin and neither can we! ps - Come on Gianino's - I know you all have digital cameras...how about a picture of this little red headed man - you're killing us!! Update 3/16/2007 7:32pm - retraction issued - thanks for the photos he's a cutie!! Get ready for about 200 pictures! Libby and I took "the kids/babies" (Bridget and Matthew) to the Jewel Box yesterday for some fabulous Spring inspired photos. The weather was just too nice not to sneak away, that and I really wanted some professional quality pics of babygirl to mark her 6 month birthday. Even tho these are like 6 1/2 month pictures, I think they'll do. They may not be perfectly professional, but I love them a lot! She was smiley and had a lot of fun with her pal Matthew. Some of my absolute favorites are when they are sitting about 8-10 feet apart from each other with one in front, one in back. We couldn't get them to sit happily next to each other as you'll see in the sequence below of the two of them where you can see Bridget goes down. It's hilarious. There she goes...don't worry it wasn't bad. Not half as bad as when mommy wasn't watching her and she fall over backward and banged her head on the concrete...that was BAD. Want to see 'em all? Now before I hear any lip about the new photo site, I had to post them temporarily there since the files are so large, I can't upload them all to shutterfly. If you want any, just email me and I'll post them to wherever your little heart desires. It's no secret that I'm a wannabe Irish-girl, so I thought I would get ready for the big holiday by using my daughter to create the cutest St. Patrick's day header ever. In case it's not clear the "name" I'm referring to in the header is mine - Erin. Some people thought that may not be clear, I think some people are just stupid. Still busy working on the new going-ons at the CWC headquarters. It's really not too exciting so to ensure I don't create a bigger buzz than is warranted, I will give you a hint: it really just has to do with organizing and some new equipment. That's really about all, but there will be some good pictures to come hopefully by the end of the weekend. In other news, my little 1/4 Irish baby or however much she is has been very busy lately (and not just working in the CWC offices). She is almost fully sitting - picture a weeble wooble that usually makes it back upright after wobbling forward back and side to side. She is also eating some rice cereal now, too. She's had a couple feedings and basically took to it like "what's the big deal here people? it's not rocket science, it's a spoon"... at least we're pretty sure that's what she was thinking. She is also training for the upcoming 5 miler downtown on St. Patrick's Day. So far she's up to about three miles run/walking, but really seems to be good at it... although once again, she's expressed that sitting in a stroller while someone pushes you up and down hills isn't really brain surgery, either. Well, time for the best night of tv - except for the reruns, but most office's are usually worth watching again- Happy Thursday! I've discovered something about myself that I find either interesting and a sign of high intelligence or disturbing and weird so since I have about 10 minutes for something to finish copying I thought I would share... I just opened up an older client file of mine to check a password and written in close proximity to the client's all important username and password was the following three lines: oh hi, we're vacuuming, yeah that's fine. You see, almost everytime I open up an old client file or thumb through some notes or project lists I've joted down, I will find these little areas on the page where I have written down aspects of a conversation. It then makes me wonder what the context of that conversation was and I'll spend too much trying to remember who I was talking to and about what. Seriously, why did I even need to tell the caller I was vacuuming in the first place? irritating - why does he think that is funny?" - now, to give you the full effect, picture the above text bordered with little hand drawn daisies and hearts and sprinkled around were my initials and full signature both Delanty and Jones versions ... am I ten? It took me a while but I remembered the conversation with Molly last week about how Tim annoys us when he says "get off my back jack"... funny now, but that little chicken scratch could have implied something much more sinister and my unconscious writing could definitely get me in trouble some day. Anyway, without making this too long of a boring post about my idiosyncracies (some of you are already thinking "too late"), I was just wondering if everyone does that or that makes me odd in some way? I am in the midst of some very exciting stuff right now and I really have so much to blog about that it's pretty ridiculous that I just took up some blogging time writing about my weird habits... but you'll have to stay tuned to find out what I (err...we... I guess Bridget is kind of helping) have got cooking up for Custom Web this week! BTW, that's called "pulling a Preszler" - when you lead someone on just to make them keep tuning back into you. Cindy Preszler that is - for those of you saying what the hell is she talking about now?